This is lazy, hazy stuff to daydream to on a day as vapour trails from the exhaust of commercial passenger planes flying overhead on a bright, sunny day. The Silent Sunrise is the first LP from shoegazers a Shoreline Dream in about three years, but the wait was worth it. Originating in Barnum, Colorado – namesake of circus pioneer P.T. Barnum – A Shoreline Dream mines a kaleidoscope of sounds on their latest release. Mixing songs with lazy vocals pushed down in the mix with sterling instrumentals, The Silent Sunrise is what you’d get if My Bloody Valentine walked onto the ‘80s set of a John Hughes movie. With guitars sounding agreeably Cure-like to create swirling melodies of sound, this is music that pushes you against the wall and demands that you listen. The album is built as a whole, with the six-minute “Twice Removed” (also the name of a great Sloan album, arguably their greatest) forming the centerpiece. This is lazy, hazy stuff to daydream to on a day as vapour trails from the exhaust of commercial passenger planes flying overhead on a bright, sunny day. If there’s anything to find fault in The Silent Sunrise it’s that sometimes the group’s ideas exceed their production budget. The instrumentation is, in places, so thick that the result is simply a blob of sound, making it hard to distinguish the melodies buried deep within those layers. At other times, the production seems airy and light, suggesting that the group can access only the cheapest in recording equipment. Those deficiencies aside, The Silent Sunrise has the requisite chops in a genre where too much similarity can bore the listener. 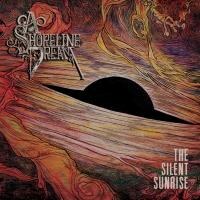 While I wouldn’t go as far to say that this group is doing new things, I do find it fascinating that a Shoreline Dream mixes traditional shoegaze with more instrumental passages, such as the acoustic guitar strummed “Between”. Fans of dream pop can do no wrong in looking for this album and investigating all of its delicate curves and beauty. Hardly silent, The Silent Sunrise is a glorious dawn.